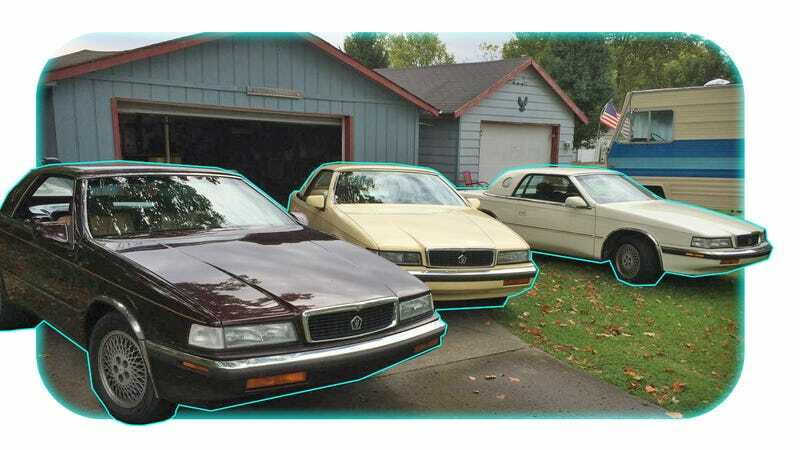 Ten years ago, an Indiana man named Jim Campbell found himself looking for a LeBaron convertible for his winter home in Florida, when he came upon an example of the highly controversial Chrysler TC by Maserati. He bought it, loved it, and then decided he needed another one for his home in Indiana. Then he purchased another TC. Then another. Then nine more. Now his impressive collection of 13 is for sale. But most car folks aren’t looking for TCs, which were the laughingstock of the industry for years—selling in tiny numbers (just over 7,000 over three model years) and demonstrating that slapping a Maserati trident on the hood of a K-Car-drived, boxy coupe and charging lots of money isn’t going to fool anyone. The car, in case you’ve forgotten or forced yourself to forget, was a grand touring convertible made by Chrysler not dissimilar to the much cheaper LeBaron of the time. Except this was made in Italy with some fancy Maserati styling, and the engine, while assembled and tweaked by Maserati, wasn’t far off the turbocharged 2.2-liter four-cylinder used in many Chrysler and Dodge cars. A Mitsubishi-built V6 could be had later in its production life. It’s a bizarre machine, and widely considered a flop today. Still, even if they weren’t so compelling when new, TCs become relatively cheap, and are still fairly cushy inside. That’s why Jim, an Anderson, Indiana native who retired after a 30 year career at General Motors’ Delco Remy subsidiary (he worked 26 years in a starter plant) picked up his first TC 10 years ago. A self-proclaimed “Snow Bird” who heads to Florida every winter, Jim was looking for a LeBaron convertible to act as his second car in the Sunshine State, having previously owned and enjoyed a LeBaron. That’s when he came across the TCs, which were comparably priced. He told me over the phone that he liked the idea of a hardtop, since he’d have to store the car in a carport, and not a garage, over the summer. He’s also a fan of the looks, and the cushiness. “I look the looks of them... I like [that] they’re a comfortable car,” he said, going on to say he was always a fan of mid-’50s Ford Thunderbirds with porthole tops. The TC, which was about the same size and also had a porthole top, reminded Jim of the old T-bird, except the Chrysler was cheaper and easier to get into and out of. So he bought a TC in Florida, liked it, and decided he wanted a second one for his home in Indiana. Eventually he found one, but decided he wanted a different color. “I looked around, and it just kinda snowballed on me,” Jim told me. He started with the eight-valve four-cylinder turbo, but he “had to try the six cylinder,” and in time, he decided that if he was going to own TCs, he wanted the top of the line model: the 16-valve, four-cylinder turbo with a five-speed, of which only 501 were produced according to Jim. So he bought one, only to later have a chance to snag a nice one with only 36,000 miles on it. “It was a really top notch car all the way through, and the price was right on it, so I went ahead and bought it,” Jim told me. The self-described “car nut” told me that the 200 horsepower Chrysler is a lot of fun to drive with that Getrag five-speed (The 161 HP inline four and the 140 HP Mitsubishi-sourced V6 were both mated to automatics). “It kinda scares me a little bit; I don’t wanna get on it too hard,” he said. Jim described his thought process on picking up all these TCs from Craigslist. “If I see something I like, I like to get it,” he said, “And right now, I happen to like these cars.” Jim now owns one of every color offered on TCs and at least one vehicle from all three available model years. Jim says he’s getting rid of the TCs (he’s already sold two or three) because he’s simply got too many cars, and he can’t drive them all. Plus, he’s worried about being able to store the vehicles, and about his age restricting him from being able to take care of the cars the way he wants to. I can’t say I blame him. These cars are actually kind of cool, especially with a manual.